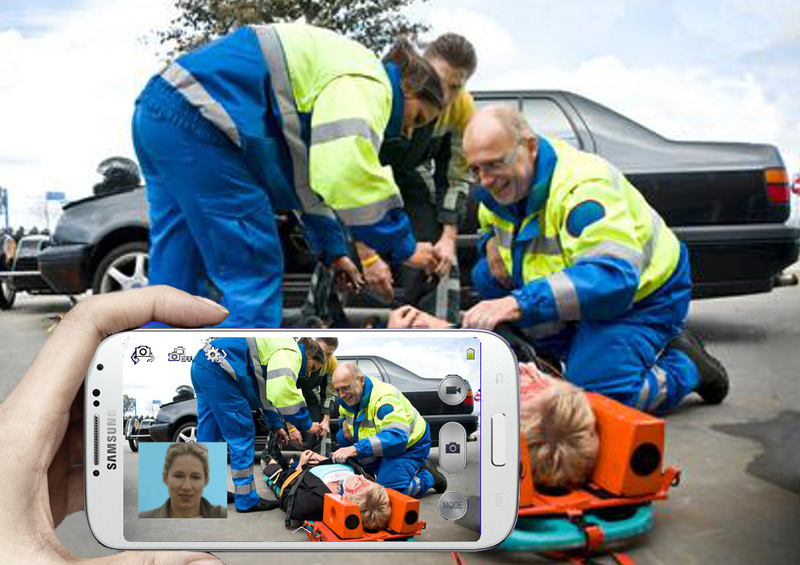 ← Dr Eric Topol, Dr Leslie Saxon, Dr Ben Freedman, Prof John Camm OR iMedicalApps Residents? 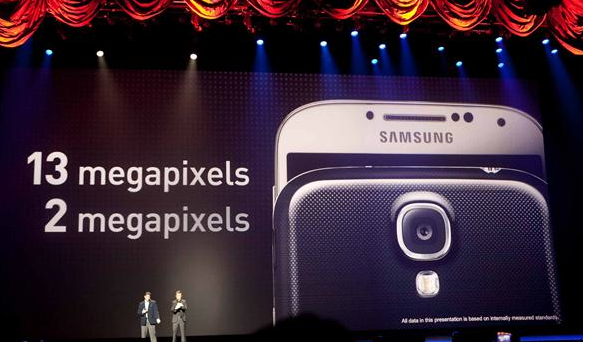 Last night “Samsung UNPACKED 2013 Episode 1” was held at New York’s Radio City Music Hall and saw the world’s biggest mobile and smartphone manufacturer lifting the lid on their latest flagship smartphone – the 5in Galaxy S4 set to hit UK shelves from the 26th April. 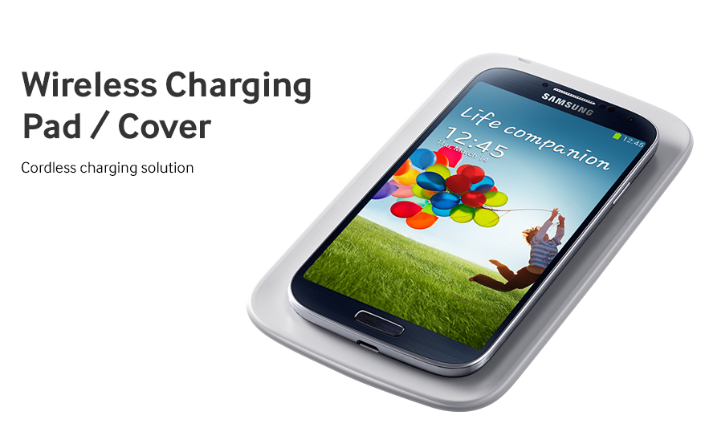 Setting new smartphone benchmarks the 130g device packs the latest version of 4.2.2 Jelly Bean Android OS running on a 5” Full HD Super Amoled Display with 441 pixels per inch, with a big battery (up from the GS3’s 2,100mAh to 2,600mA) and camera upgrades (front is now 2mp with 720p video and rear is up to 13mp with autofocus). It’s quite obvious that such a powerful new device will support some quite transformational mHealth opportunities (Will Samsung’s Smart Scroll turn the world upside down for mHealth Regulators?) 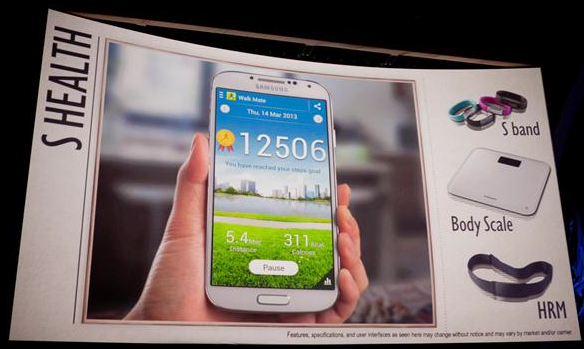 and it was great to notice that Samsung kept the S Health announcement for the finale of the presentation. Ensuring BlackBerry doesn’t steal a lead with their BlackBerry Balance solution that creates a securely partitioned device was a very smart move from Samsung. This feature is critical to any mHealth innovation based on Healthcare Workers bringing their own device (BYOD) to work. Without this it’s a piece of cake for Healthcare IT leaders to restrict/discourage this important driver of innovation from happening as they simply point out to the clinician that all their private SMS, photos etc would be discoverable if they are made using the same device socially that they are using for work. A siloed approach prevents this being an issue as the software ensures the device is regarded by regulators etc as two separate devices. I get the impression this is approaching the Doro Experience from a very different angle that should be very interesting as we look to expand access to smart devices via more user friendly user experiences. 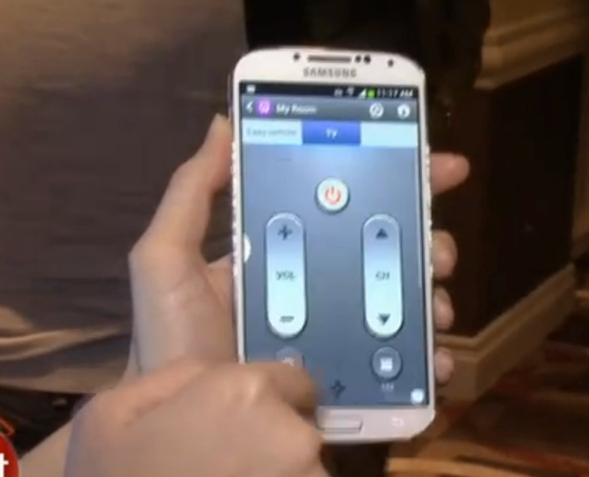 This feature has been seen on the capacitive touch screen of the Nokia 920 before and it’s great to see Samsung are bringing it to their devices as many of today’s touch screens are challenging for elderly or patients to use because they lack fingertip conductivity due to hard dry skin. > Temperature extremes and dehydration commonly lead avoidable healthcare expenditure and huge death tolls eg. in the European heatwave in 2003 led to 70,000 deaths. 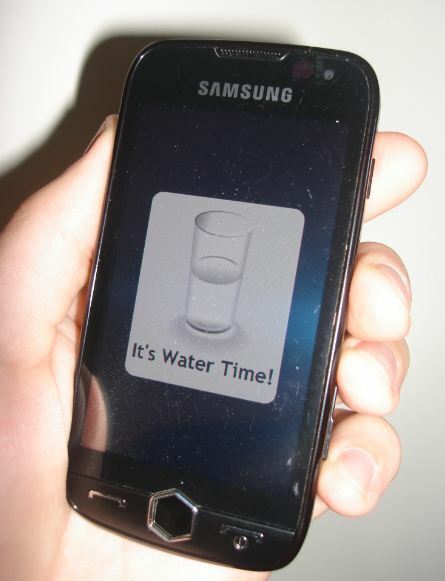 Twinned with a drink water reminder app I can see this saving lives – especially as it edges down into feature and then easy/senior mobiles. > Monitoring of Patients who have chronic conditions that are effected by climate. All too often a lot of this goes unnoticed because until now we simply had no means of easily gathering this data reliably but can you imagine this data being used to understand better triggers for epilepsy or asthma (via mobile connected inhalers) or pain in patients with arthritis? > Monitoring of those who are living independently. Imagine the British Gas/Bord Gáis app that helped the energy company better understand customer needs and alert their response teams in the event of a boiler break down? > Optimisation of living environments eg. by twinning the data from these sensors with your mobile connected thermostat/HVAC system (see Nest) and sleep monitor you might be able to regulate the temperature of a bedroom for example so that it drops a few degrees overnight to help you sleep better but rises a little to give you an extra boost when waking up? 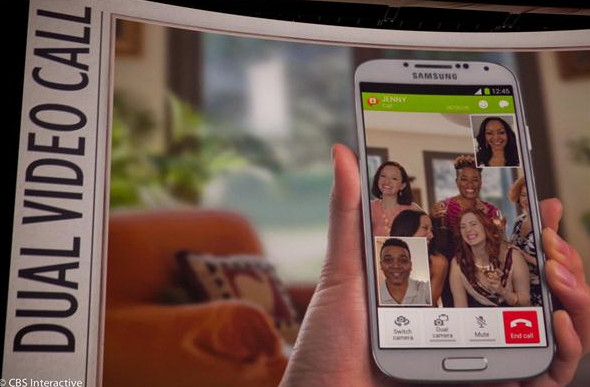 This is going to make the device great to use for reading and I can think of some great reading opportunities and imagine the value such seamless interface control will be able to add to screen/file sharing video calls. For Doctors in clean environments wearing gloves etc I can imagine the ability to control a docked device without physical contact is going to be interesting. The ability to have a video pause when you look away will mean you never miss any action. I can imagine this is going to be very desirable for advertisers but it also opens a range of opportunities to verify the provision of information e.g. being used to ensure a healthcare professional has watched an instructional training video (no CPD points if you don’t watch it all!) or ensuring a patient info on consent video has been watched. Perhaps a worker living abroad calling home to wife and kids and then bringing mum into the call from her hospital bed, or a Video Call with a Nurse or Emergency Call Handler who brings in the Doctor “Let’s just check this result with the 3G Doctor to be sure” would’ve worked better in my opinion because it would’ve better highlighted the value of this tech in my opinion. An InfraRed signal might not seem breakthrough but I think it’s going to prove very popular. 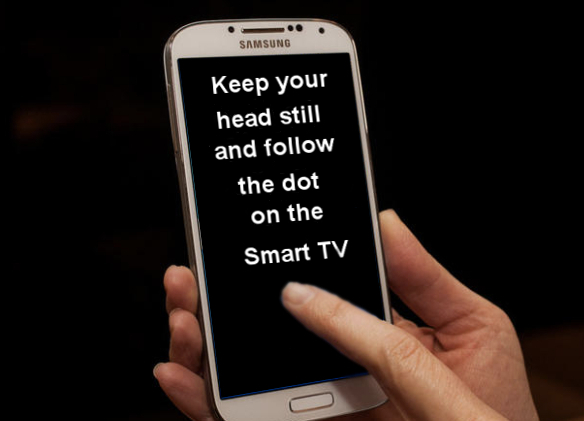 Taking over the TV controller is going to enable Samsung to really be at the centre of personal entertainment and drive lots of appeal and then user familiarity amongst senior audiences. I’ve found this is a technology that is loved by seniors. The ability to just drop the device next to the bed is really elegant and obviously get’s around the need to fiddle with those horrendously designed fiddly micro USB leads. A big problem I’m seeing in healthcare enterprise uses of iPads is that there batteries just can’t last the full working day. Sure you can have a backup phone etc but the ability to have one of these in the car for a health visitor is just so welcome to anyone who’s got important work to do with the device. 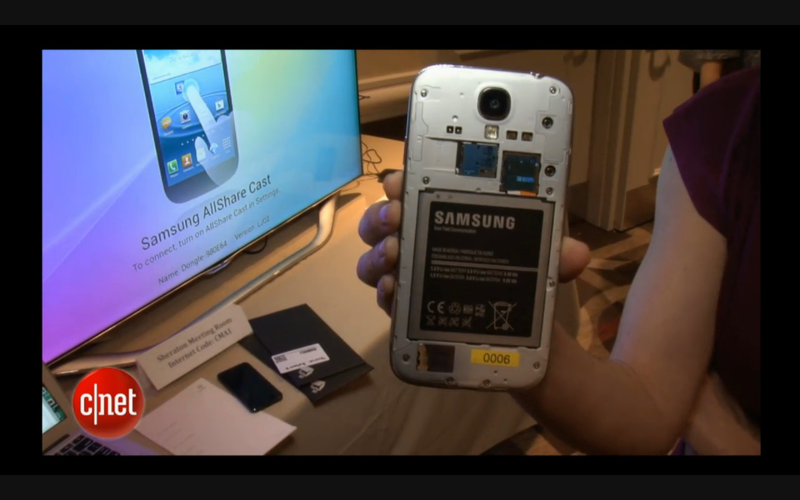 I also saw Samsung Marketing doing some great event marketing at the recent SXSW where they offered those who were active on social media the opportunity to tweet them to get a battery swapped out for a charged one. I really hope we see more of this at tech shows as it’s a great way of brands helping fans of their hardware to get their voices out. 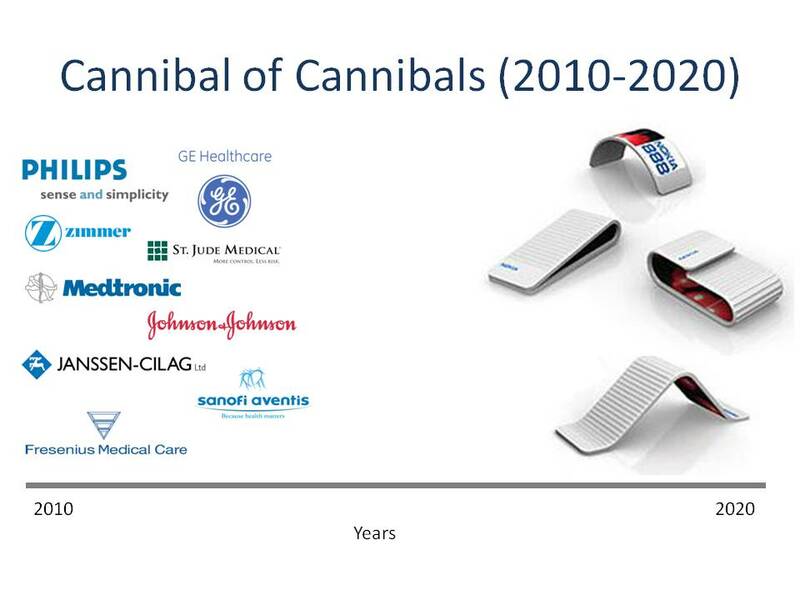 With the original S Health announcement Samsung had shown it’s capacity to work with top medical device partners. I had thought this was an expression of intent by Samsung to take mHealth very seriously so it’s a bit disappointing that none of the devices shown in New York had validated medical device status. With Samsung Group’s capacity to build practically anything this development isn’t a big surprise but I believe it will limit the initial healthcare professional opportunities. On the plus side low cost own branded devices are really going to boost the adoption of S Health which I’m confident will in turn drive demand (and the required retail space) for more professional/expensive peripherals. 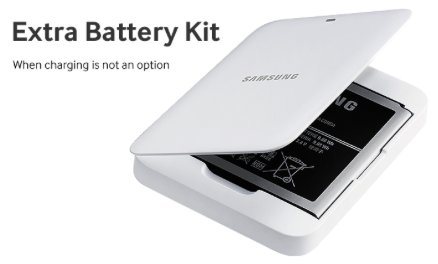 If Medical Device manufacturers don’t think a mobile brand is going to replace them before the decade (just as Nokia mobiles cannibalised cameras, calculators, etc, etc) they should look long and hard at this brand extension by Samsung. I personally don’t quite see the need for Samsung to range this, no doubt their MNO customers want this to rival the Nike Fuel Band’s and Jawbone UPs but I’d be surprised if this is needed as the built in pedometer’s Samsung’s already sold on millions of it’s Asian market retailing smartphones have already cannibalised this motion sensing tech by several orders of magnitude. Perhaps the mobile operators with their obsession with marketing to young customers will prove me wrong by making these bright coloured bands popular but I get the feeling most telcos aren’t going to ship the device with this accessory as the recall/return rate to date on these devices would be very undesirable and could have a knock on effect on the smartphone in markets where it is sold subsidised. 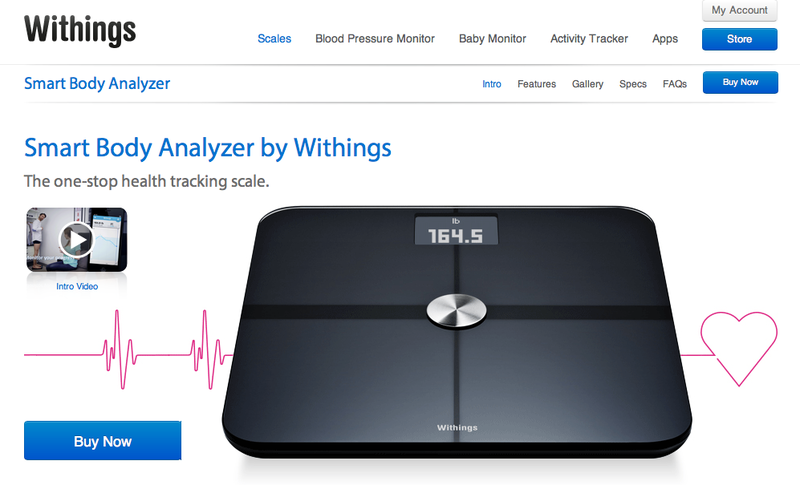 I recall how Withings used to go with this phrase to describe their digital WiFi connected weigh scale but it seems to have been dropped in favor of the new term Body Analyzer so I wonder if there are some branding issues at play. It surprises me that Samsung haven’t branded a medical device manufacturers device (like the A&D and Omron devices in the initial S Health announcement) as this would’ve added more accuracy (important with digital readings) but perhaps we’ll see that launched as a premium alternative with the Samsung device ensuring there is enough profit to enable mass market mobile retailers to give over shelve space to medical devices. 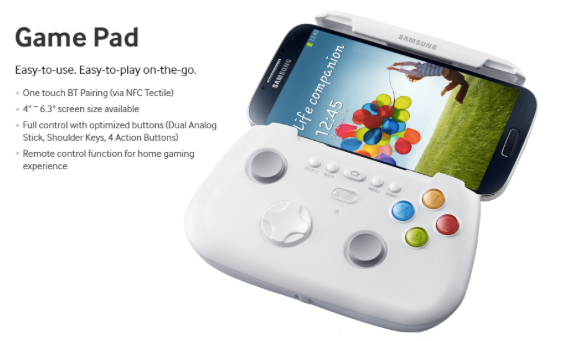 Personally I’m not really seeing this working as a profitable product in the line up for Samsung. If I was Samsung I’d have gone with an earphone embedded HR monitoring alternative that would offer greater cool factor and could be neatly paired with the music player. I’m surprised there wasn’t more focus on a glucose monitoring accessory as all the Telcos mHealth units have ambitions to get into this market and a mobile brand twinned device would be key to this. 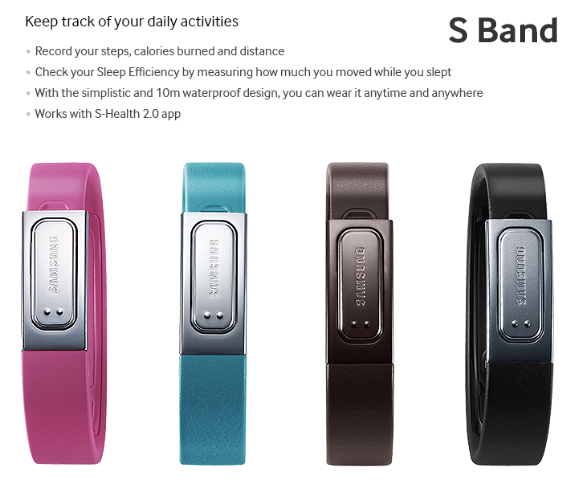 It would also be attractive as a way of positioning Samsung’s Health goals with S Health as so far uncalibrated pedometer, weigh scale and chest strap really aren’t taking it out of the already possible Fitness market (if that was their objective presumably this would’ve all been branded “S Fitness”). 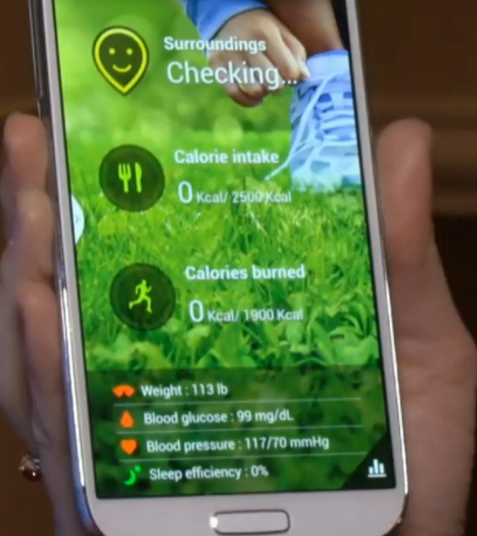 From the event it looks like a connected diabetes monitor nearly made the final cut too as the S Health app screenshots all show Glucose level reading prominently. Fortunately the native S Health app has a BG field so you can still connect with this market (patients will just need to add the readings themselves). Perhaps we’ll see a neat app added that will let the patients add their data via the speech transcription technologies we saw neatly demoed with the native S Translation app. 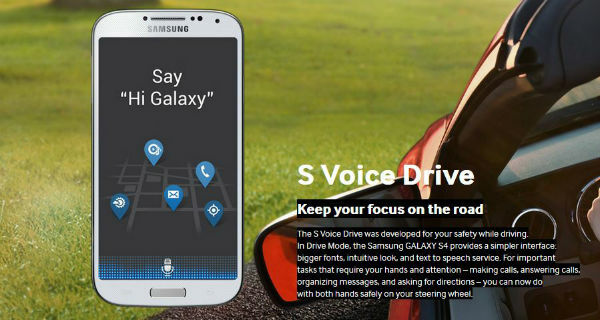 Is Samsung trying to do too much outside of the device? I think one of the things that’s really working well for Apple is the innovation in accessories and apps that it’s driving. While it’s great to see sure footed actions I’m not sure Samsung’s going to get the same if it keeps trying to do everything. 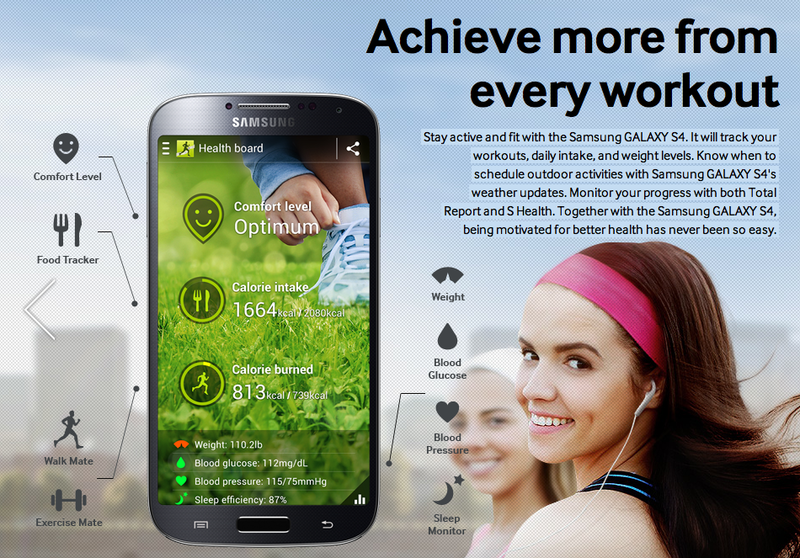 Although it failed for Nokia’s Wellness team I think a strategy where they give S Health away to encourage partners like gyms, pharma brands and HCPs to build for Samsung. 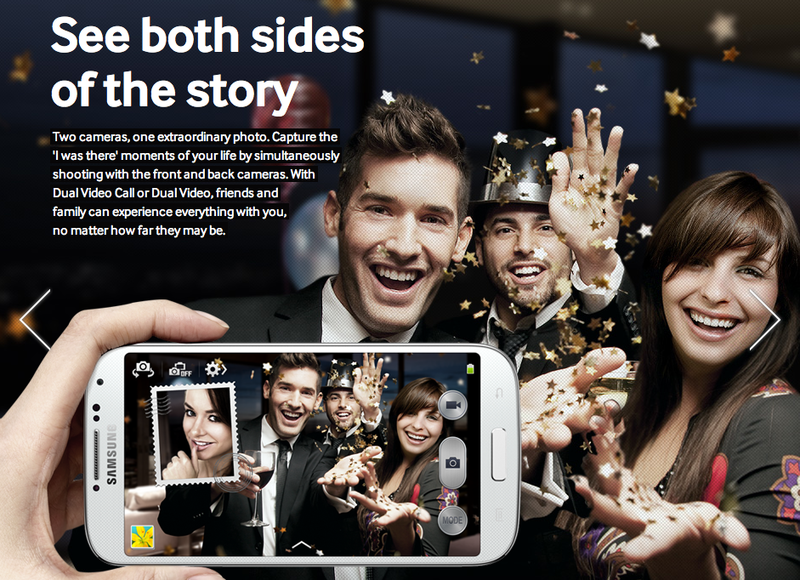 What mHealth opportunities do you see in Samsung’s Galaxy S4?